I’m a healthy guy, generally speaking. I eat a relatively healthy diet, I exercise vigorously several times a week, I don’t drink to excess or use any other unhealthy recreational substances. But, owing to a congenital condition that I won’t bother detailing, I need to have a minor surgical procedure every few months. Every three is optimal; four is passable; five is pushing it; if I wait six months, I end up having to have the procedure done under anesthesia in a hospital setting. Obviously, I try for the three-month interval–sort of like an oil change or tire rotation. It’s more uncomfortable than painful, and I don’t want to be a baby about it, but I try to leave the rest of the morning clear and perform a little self care afterward. By “self care,” of course, I mean donuts. Time was, I’d walk home from this appointment by way of a Perfectly Adequate Well-Known National Chain Donut Shop, pick up a couple of crullers and a mocha latte, and return home to sit on the couch with a cat purring nearby and British game shows on the television. But I’ve come to prefer my house blend coffee to their weak and over-sweetened brew. And, once, having to rush to the train station after an appointment, we stopped at a local shop I’ve been passing for years without visiting and discovered the wonder that is the Apple Spider. A spider isn’t a donut, but it’s made of the same sort of dough, filled with spiced apples, fried and glazed. It’s a wonderful combination of crunchy exterior, cake-like interior, sweet glaze and crisp filling. I don’t know why it’s called a spider. 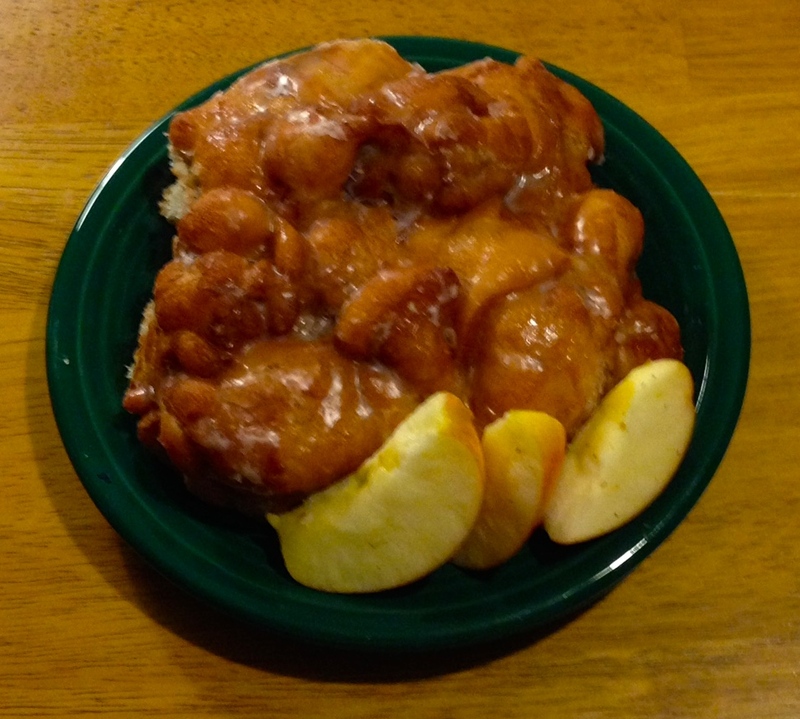 In some parts of the world it would be called a fritter. In some parts, it’s probably spoken of only in the hushed tones befitting contraband. But considering the Moderation Rule, I’m happy to enjoy one a couple of times a year. Yesterday’s was accompanied (in the interest of dietary balance) by some slices of fresh apple and a wedge of cheddar cheese–along, of course, with excellent coffee, a purring friend, and a single episode of Pointless. I’m not sure it’s exactly what the Doctor ordered, but it’s what I needed to recover a bit before the rest of a very full day.